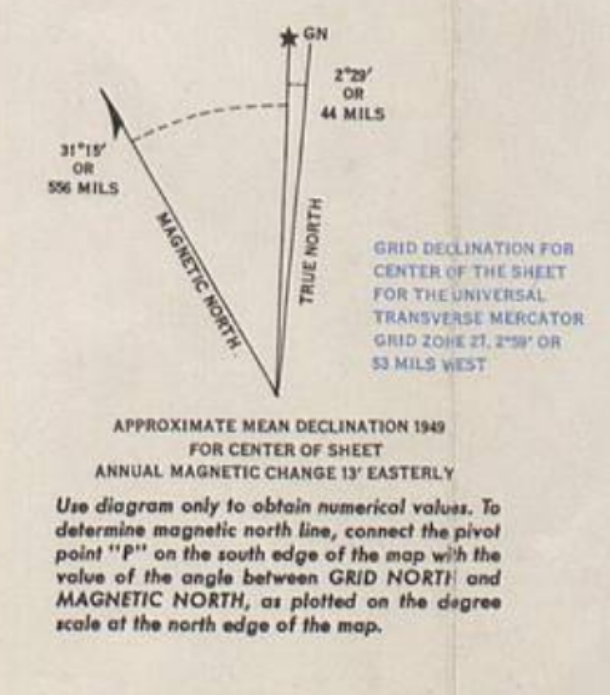 On the U.S. Army Map Service (AMS C762) 1:50,000 maps made of Iceland 1948–1951, there is a scale marking at the top which shows degrees, I suspect angles. In the image below it shows 25°–29°. It increases to the left, which suggests it might refer to degrees longitude west, but the numbers are not correct; the map covers 18°W–18°30'W. It's not a magnetic declination either, which is shown elsewhere on the collar in the usual way. Other maps in the series have a similar scale in the same place, but the numbers may be different. What does this angle scale mean? I believe it is actually used to generate a Magnetic north line, using the reference point P on the bottom edge of the map. At least that's how I interpreted the statement in the declination legend (shown below) which seems to refer to the scale you mentioned. I picked a sheet a random. At the time the map was done the angle was 31.25 (+ 2.5 degrees?) degrees from grid north, very close to the middle of the equivalent scale I saw in that sheet. Presumably they added a few degrees either side to extend the usability of the map into future years. Not the answer you're looking for? Browse other questions tagged maps topography angles iceland or ask your own question. What is the effective and legal way to get map tiles for the size of 2 or 3 states? Can someone help me identify this part of the map?